Export Regions: China/Hong Kong, Eastern Europe/C.I.S., Japan, Mexico, Middle East, South Asia, South-East Asia, USA - North Central, USA - North-East, USA - North-West, USA - South Central, USA - South-East, USA - South-West, Western Europe. SPIROL is a technical resource that provides high quality components that improve the quality of your assembly, extend the life of your products and reduce your manufacturing costs. In addition to high quality products, SPIROL has Application Engineers throughout the world to assist you in your designs, supported by state-of-the-art manufacturing centers and worldwide stocking facilities to simplify the logistics of delivering your product. SPIROL can be found on 4 continents within the following 12 countries: Brazil, Canada, China, Czech Republic, England, France, Germany, Korea, Mexico, Poland, Spain, United States. Involve SPIROL Engineering early in the design stage of your next project! IATF 16949 certified manufacturing of Stainless Steel Alignment Dowels/Bushings used to locate components with respect to each other. Hollow design permits bolt to pass through the ID. Staggered seam eliminates interlocking. Free Application Engineering support. Installation equipment also available. IATF 16949 certified manufacturing of Alignment Dowels/Bushings used to locate components with respect to each other. Hollow design permits bolt to pass through the ID. Staggered seam eliminates interlocking. Free Application Engineering support. Installation equipment also available. IATF 16949 certified manufacturing of brass, aluminum and steel Compression Limiters designed to protect plastic components of an assembly from compressive loads generated by the tightening of bolts. Complimentary Application Engineering support. Installation equipment also available. ISO 9001 certified manufacturing of DIN EN 16983 (formerly DIN 2093) Group 1 and Group 2 Disc Springs. Full range available from stock. Complimentary Application Engineering support. IATF 16949 certified manufacturing of Alignment Dowels and Dowel Bushings, Coiled Spring Pins, Slotted Spring Pins, and Solid Pins. Free Application Engineering support. Installation equipment available. IATF 16949 certified manufacturer of fasteners for plastic components. 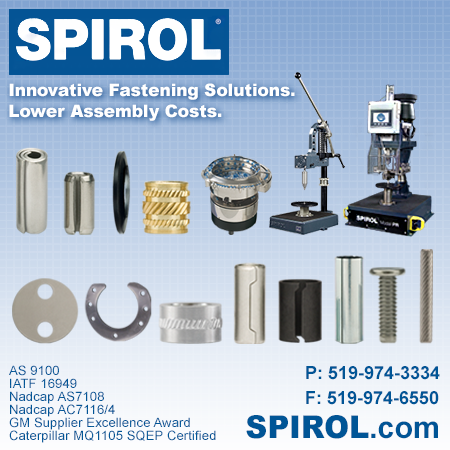 SPIROL produces Coiled Spring Pins, Disc Springs, Solid Pins, Alignment Dowels/Bushings, Spacers, Compression Limiters, Threaded Inserts, Slotted Spring Pins, and Shims. Complimentary Application Engineering support and Installation Equipment also available. SPIROL's products are found in hundreds of applications for automotive components. IATF 16949 certified manufacturing of Threaded Inserts for Plastics, Coiled and Slotted Spring Pins, Solid Pins, Alignment Dowels/Bushings, Spacers, Compression Limiters, and Shims for automotive applications. Complimentary Application Engineering support. Installation equipment also available. IATF 16949 certified manufacturing of Coiled Spring Pins, Disc Springs, Solid Pins, Alignment Dowels/Bushings, Spacers, Compression Limiters, Threaded Inserts, Slotted Spring Pins, and Shims. Complimentary Application Engineering support. Installation equipment also available. SPIROL sells industrial metric fasteners. Our engineering services provide a comprehensive evaluation of the requirements of your application from hole size, component materials and environmental exposure to assembly methods, performance expectations, and cost requirements. Our vast experience can shorten design and development as well as improve application performance. Certified to IATF 16949, AS9100, NADCAP AS7108, NADCAP AC7116/4 and AN/MS/NAS/NASM military specs. Manufacturing of Coiled and Slotted Spring Pins, Solid Pins, and Precision Shims for aircraft, military and commercial applications. IATF 16949 certified manufacturing of Coiled Spring Pins, Slotted Spring Pins, and Solid Pins. SPIROL offers complimentary Application Engineering support. Installation equipment also available. SPIROL is an IATF 16949 certified manufacturer of fasteners for plastic components including Coiled Spring Pins, Slotted Spring Pins, Solid Pins, Disc Springs, Alignment Dowels and Bushings, Spacers, Compression Limiters, Threaded Inserts, and Shims. Complimentary Application Engineering support and Installation Equipment also available. SPIROL produces Stainless Steel fasteners. Our engineering services provide a comprehensive evaluation of the requirements of your application from hole size, component materials and environmental exposure to assembly methods, performance expectations, and cost requirements. Our vast experience can shorten design and development as well as improve application performance. IATF 16949 certified manufacturing of brass, aluminum and stainless steel Threaded Inserts for plastics including Heat/Ultrasonic, Self-Tapping, Moulded-In, Press-In, and Expansion Inserts. Complimentary Application Engineering support. Installation equipment also available. IATF 16949 certified manufacturing of brass Threaded Inserts for plastics including Heat/Ultrasonic, Self-Tapping, Moulded-In, Press-In, and Expansion Inserts. Complimentary Application Engineering support. Installation equipment also available. SPIROL sells threaded inserts. Our engineering services provide a comprehensive evaluation of the requirements of your application from hole size, component materials and environmental exposure to assembly methods, performance expectations, and cost requirements. Our vast experience can shorten design and development as well as improve application performance. IATF 16949 certified manufacturing of Coiled Spring Pins. Three duties provide a range of combinations of strength, flexibility and diameter to suit different holes and materials. World's largest Coiled Pins inventory. Free Application Engineering support. Installation equipment available. SPIROL sells dowel pins. Our engineering services provide a comprehensive evaluation of the requirements of your application from hole size, component materials and environmental exposure to assembly methods, performance expectations, and cost requirements. Our vast experience can shorten design and development as well as improve application performance. SPIROL manufactures several different styles of Alignment Dowels and Pins. Our engineering services provide a comprehensive evaluation of the requirements of your application from hole size, component materials and environmental exposure to assembly methods, performance expectations, and cost requirements. IATF 16949 certified manufacturing of Coiled Spring Pins, Solid Pins, and Slotted Spring Pins. Complimentary Application Engineering support. Installation equipment also available. SPIROL sells knurled pins. Our engineering services provide a comprehensive evaluation of the requirements of your application from hole size, component materials and environmental exposure to assembly methods, performance expectations, and cost requirements. Our vast experience can shorten design and development as well as improve application performance. SPIROL sells metric pins. Our engineering services provide a comprehensive evaluation of the requirements of your application from hole size, component materials and environmental exposure to assembly methods, performance expectations, and cost requirements. Our vast experience can shorten design and development as well as improve application performance. IATF 16949 certified manufacturing of Coiled and Slotted Spring Pins. Coiled Pins in three duties provide a range of combinations of strength, flexibility and diameter to suit different holes and materials. Free Application Engineering support. Installation equipment also available. SPIROL special order products Tubular Products include Tubular Rivets, Shoulder Rivets, Tension Sleeves, Short Spacers and Connectors. Complimentary Application Engineering support. Installation equipment also available. Certified manufacturing to IATF 16949, AS 9100 Revision B, NADCAP AS7108 and NADCAP AC7116/4. Single Shims, Thin Spacers, Laminated and Edge Bonded Shims, Pump Shims, Specialty Washers and other flat components used for spacing and wear. Fast delivery. No tooling charges. SPIROL sells aircraft shims. Our engineering services provide a comprehensive evaluation of the requirements of your application from hole size, component materials and environmental exposure to assembly methods, performance expectations, and cost requirements. Our vast experience can shorten design and development as well as improve application performance. ISO 9001 and AS 9100 Revision B, NADCAP AS7108 Chemical Processing, NADCAP AC7116/4 Unconventional Machining certified manufacturing of brass Shims. CNC laser cutting and proprietary SWAT tool-less technology. Stamped and machined (CNC) Shims. Fast delivery. No tooling charges. ISO 9001 and AS 9100 Revision B, NADCAP AS7108 Chemical Processing, NADCAP AC7116/4 Unconventional Machining certified manufacturing of metal Surface-Bonded and Edge-Bonded Laminated Shims. CNC laser cutting and proprietary SWAT tool-less technology. Fast delivery. No tooling charges. Certified precision manufacturing of laser-cut Shims to ISO 9001, AS 9100 Rev B, NADCAP AS7108 Chemical Processing, NADCAP AC7116/4 Unconventional Machining. CNC laser cutting, CNC milling, high-speed machining, CMM capabilities. Complex configurations. Fast delivery. No tooling charges. ISO 9001, AS 9100 Revision B, NADCAP AS7108, NADCAP AC7116/4 certified manufacturing of Custom Shims, Precision Washers and Laminated Shims. Low-volume laser cutting. Complex configurations. Precision manufacturing to military specs. Fast delivery. No tooling charges. ISO 9001, AS 9100 Revision B, NADCAP AS7108 Chemical Processing, NADCAP AC7116/4 Unconventional Machining certified manufacturing of stainless steel Shims. CNC laser cutting and proprietary SWAT tool-less technology. Stamped and machined (CNC) Shims. Fast delivery. No tooling charges. IATF 16949 and Ford Q1 certified manufacturing of metal Spacers used as stand-offs, distance bushings, sleeves, axles and pins. Standard diameters available in any length with no tooling charges. Free engineering support. SPIROL sells metal spacers. Our engineering services provide a comprehensive evaluation of the requirements of your application from hole size, component materials and environmental exposure to assembly methods, performance expectations, and cost requirements. Our vast experience can shorten design and development as well as improve application performance. ISO 9001 certified manufacturing of DIN EN 16983 (formerly DIN 2093) Group 1 and Group 2 Disc Springs (also known as Belleville Disc Washers). Full range available from stock. Complimentary Application Engineering support. ISO 9001 certified manufacturing of Thrust Washers, Compression Rings, Piston Rings and Cylinder Rings. Low to medium volume. Fast delivery. No tooling charges.